Financial advisor and television host, Suze Orman said it’s impossible to map out a route to your destination if you don’t know where you’re starting from. 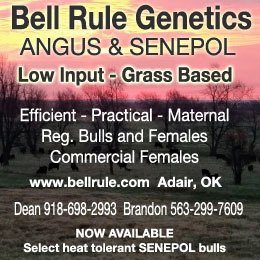 Kinda makes sense for implementing a grazing management plan and chart too. 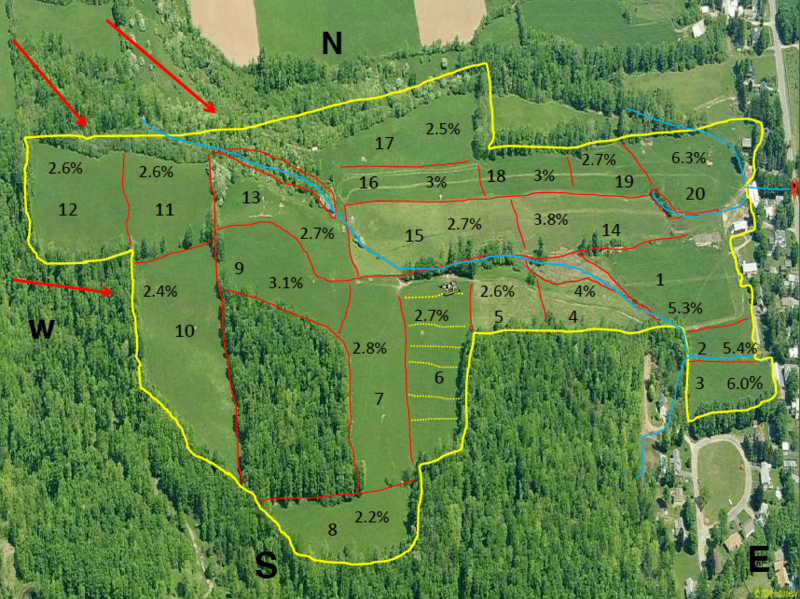 The Bishopp Family Family Farm map shows the pastures identified by number, and 2008 soil organic matter. Here’s an example of a mapping progression. At the top is the initial google map, in the middle you see the area broken down into paddocks and numbered. 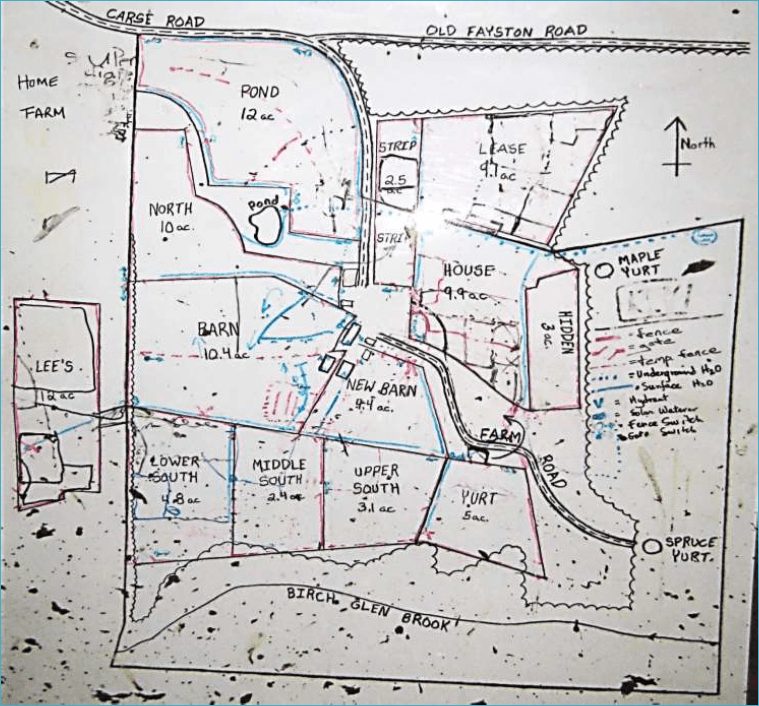 The last map includes results of soil tests so that the farmer can consider soil treatments and watch progress over time. 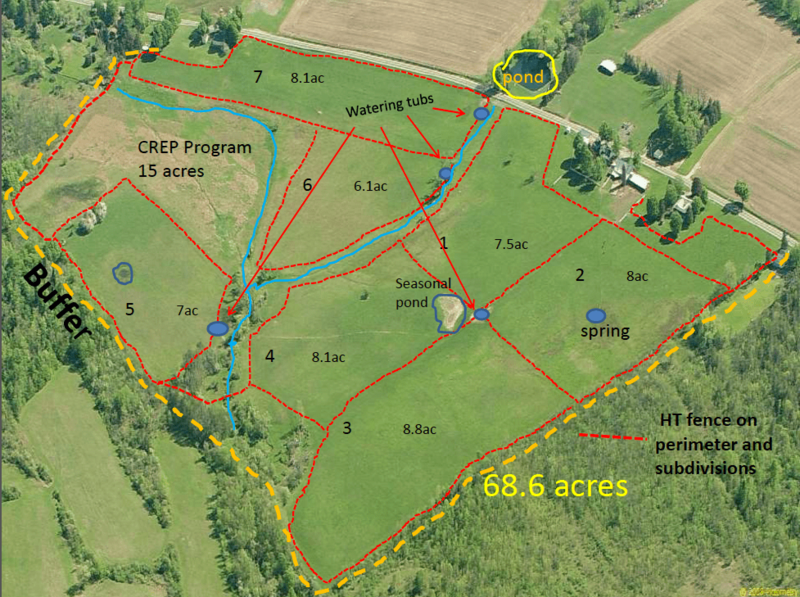 There are conservation professionals that can help you map your farm or ranch. The Farm Service Agency can help, but from my experience,their mapping delineates mostly cropland and leaves our hill-and-dale pasture fields unmeasured (although I think they would help if you asked). 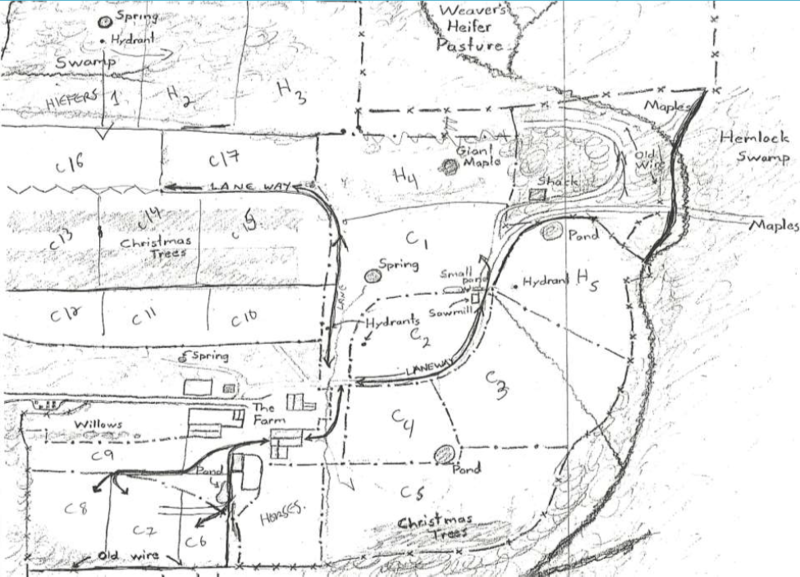 NRCS and Conservation Districts seem much more adept at helping you map your farm from a more holistic perspective. 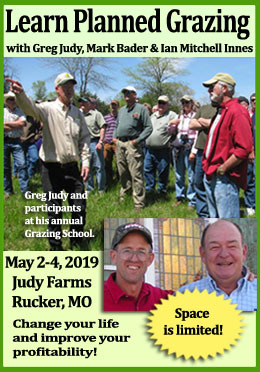 And since I am one of those grazing District peeps, I should know. Here’s how the mapping process generally goes down: I bring 2 blank pictometry, GIS or Goggle earth maps to the farm and we walk the land and record the grazing paddocks, cropfields and any other fields that would be part of the grazing plan so I can make a prettier and more accurate version back at the office. It’s entirely possible to use a measuring wheel on the land to get similar results, but it’s time consuming and field shapes make it difficult. There are GPS and App tools that will measure while you walk too and their data can be downloaded onto the laptop as part of creating a new map. If you have those tools and know how to use them, go for it. 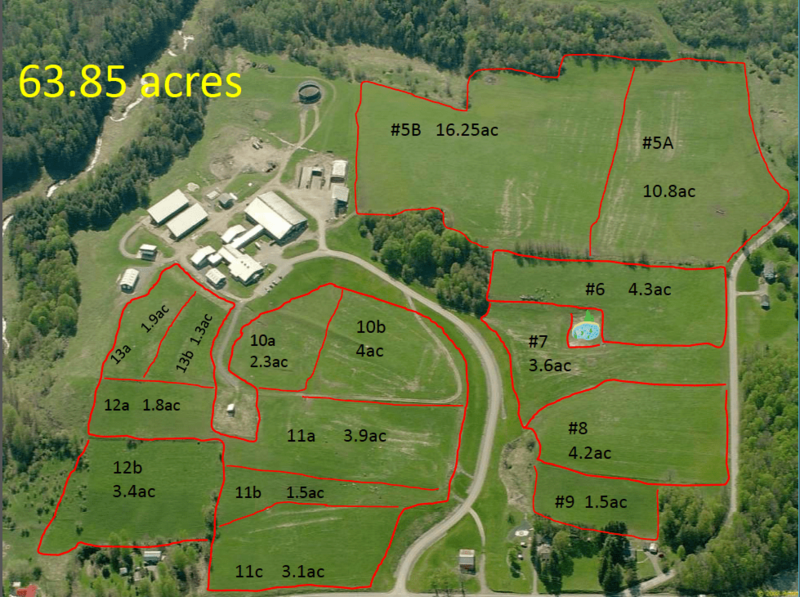 You can get your own aerial view of your property by going online to Google Maps. Once there, type in your address and when you see your location, simply zoom in until you can see your property at a size that makes it easy for you to begin adding paddock lines. What I’m saying is make it what YOU want.As far as naming the fields, I’ve seen all kinds of combinations from numbers to letters to names. Again make it flow the way you want it and so your family can grasp it too. 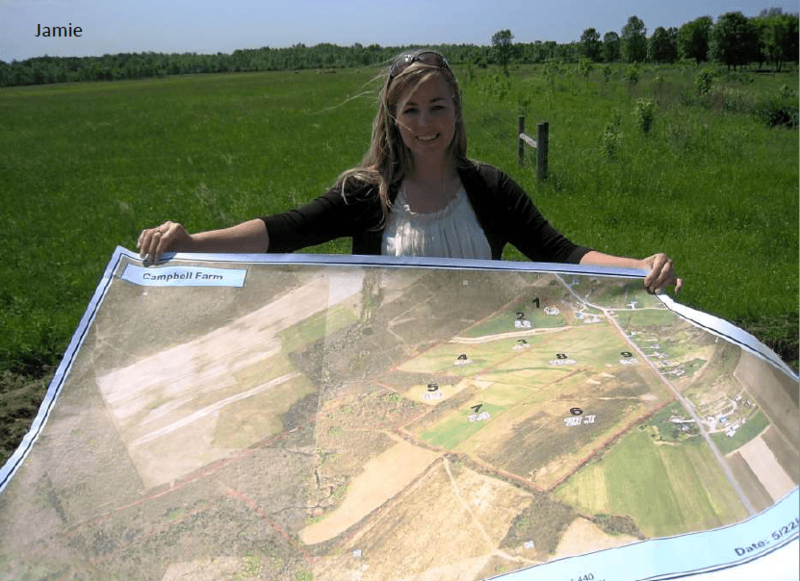 Jamie from the County Planning Department shows off the map she helped with for the Campbell Farm. I like having a good sized map after I’ve done all the creating. I work with my local county planning department gal, Jamie who sends it through her color plotter and gives me the size I want. It’s an awesome relationship if you have it. I also work with Soil and Water Conservation Districts, NRCS offices or sometimes I take a CD/travel drive to a print shop locally and get it printed for just a few bucks. The Natural Resources Conservation Service has a great tool with their soil web survey (www. websoilsurvey.nrcs.usda.gov) that will tell you all kinds of information on your land capabilities that you may want to incorporate into your plan. I also tap my nutrient management plan for field by field fertility information and integrate that into my map and chart. As I said, it’s up to you but I like all the info in one place so I see it every day without searching through binders for all the information. That helps me make better decisions. 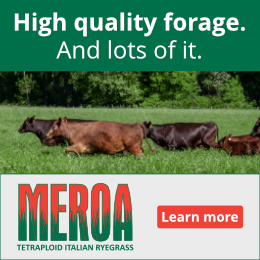 Kathy helped Troy build a new website to reflect his enthusiasm for grazing and all the help and information he has to offer. We’d be tickled if you’d click here to check it out! Once I’ve got the lines drawn on my map, how do I download it as a file, save it, print it, etc? Thanks!